Many of you have already seen the video that the very lovely Lisa at nimble by Balance Bar took of me while at the recent BlogHer conference. What a hoot! If you haven’t seen it, click here for a chuckle… and my advice on how to live a balanced life. Regardless of the video, nimble bars have seriously become my latest go-to snack. They are perfect for that little pick me up I need just before heading to the gym. In fact, I keep a bar in my purse in case I get the case of the munchies. What I love about them is that first of all, they’re really tasty. They’re only available in two flavors right now – Orange Swirl and Peanut Butter – but they are delish! They don’t taste like other grainy, heavy protein bars. The Orange Swirl tastes like a yogurt coated nougat bar that screams dreamsicle! It is so yummy. I like the peanut butter, too (How can you not? ), but I’ve been really loving the Orange Swirl. But also, these bars are packed with the nutrients we women need to look good and feel good. 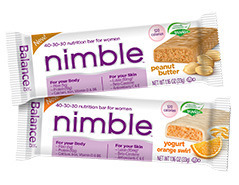 Nimble bars were made specifically for women – it’s an all-in-one 40-30-30 energy, beauty and nutrition bar. First, it helps your skin. It’s the first bar to combine Lutein and Beta Carotene. Lutein is an important carotenoid found in green leafy vegetables such as spinach and kale. A recent clinical study showed that the FloraGLO® Lutein found in a nimble bar was shown to significantly increase skin hydration by 38% over time in addition to improvement in skin elasticity. It’s also an excellent source of Beta-Carotene, which has been proven to help your skin defend against redness and UV induced damage. Huge points for me as I want to make sure to keep my skin young and supple! Next, these two ingredients are combined together with 7 other critical nutrients for your body – Protein, Fiber, Calcium, Iron, Folate, and Vitamins B6 and D.
Finally, of the 120 total calories in each bar, 40% are from carbs, 30% are from protein, and 30% are from fat – the proper balance your body needs. Anyway, eating a nimble bar has now become part of my daily beauty and health regimen. They come in 1.16 ounce single-serve bars and are certified Kosher. Suggested retail price is $1.69. For more information, go to http://www.facebook.com/nimblebar. Get Ready! Missoni for Target Coming Soon!